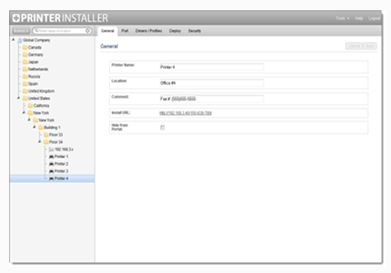 With Printer Installer, importing your current environment to direct IP printing is simple and automated. Use the provided GUI to import your existing Novell, Microsoft, or unmanaged direct IP printers. Save time by importing your existing Windows shared or Novell printers, including drivers, ports, and device settings. Silently convert all end user's existing Windows shared or Novell printers to direct IP printers. Eliminate expensive print servers. Eliminate print server management. Eliminate print server single point of failure. Eliminate pain. The Department of Homeland Security eliminated over 400 print servers and replaced them with a single Printer Installer installation with 12,000 printers. Now their 45,000+ end users located in over 1,000 locations, use the self-service portal to quickly install direct IP printers. Great Western Bank eliminated over 200 print servers and replaced them with a single Printer Installer installation with over 800 printers. Now their end users located in over 200 locations, use the self-service portal to quickly install direct IP printers. The Printer Installer web based self-service printer installation portal empowers end users to quickly find and install printers. The intuitive web based self-service portal empowers even the most IT challenged users to install their own printers without calling the help desk. When users open the self-service web portal, the portal automatically opens to the folder containing nearby printers. Printer installation is so easy that even your users are going to be able to do it without calling the help desk. Deploy by IP Address Range Membership. Deploy by AD group, user, computer, container or OU membership. Use the web based administrator to easily add and remove printer deployment assignments. AD integration allows administrative users to authenticate with AD credentials. Aon, a Fortune 500 company, eliminated their print servers and replaced them with a single Printer Installer installation with 5000+ printers. Now their 30,000+ end users, located all over the world, use the self-service portal to quickly install direct IP printers. IBC Bank eliminated over 200 print servers and replaced them with a single Printer Installer installation with over 500 printers. Now their end users, located in over 200 locations, use the self-service portal to quickly install direct IP printers. Printer Installer allows you to centrally manage all the components of direct IP printing. Use the web based administrator to create and manage direct IP printer objects and their associated drivers, profiles, comments, locations, and documentation. Support multiple untrusted domains and multiple forests. Create and configure printer objects, upload and manage drivers, and pre-configure driver device and preferences. Specify who has rights to logon to the Administrator (AD integrated) to manage printers. Use different roles to allow specific print management tasks. Delegate print management rights only to the printers you want them to manage. Simplify RDS, Virtual Apps, Virtual Desktops, and VMWare View printing. Use the web-based Printer Installer Administrator to configure proximity printing by associating printers to end point devices (Windows thick or thin clients or non-Windows thin or zero clients). When users connect to a session, they will have the printers you want them to have according to the end point device they are connecting from. When users disconnect and reconnect to the session from a different end point device, the session printers are automatically refreshed to show the printers associated to the new end point device.